Spring at the Island Manor, Chincoteague! Spring has sprung on beautiful Chincoteague Island! What a perfect time to enjoy our little island, as the local businesses reopen for the upcoming season you are able to stroll main street’s art galleries and gift shops before the summer-season crowds arrive. April 9th and 10th we celebrate with the annual Daffodil festival, Chincoteague Center’s Annual Flower, Home & Garden Show and Annual Spring Craft Show. In addition, participating galleries and shops are open extended hours with special events on Saturday April 9th with the kick off of Chincoteague’s 2nd Saturday Art Stroll. 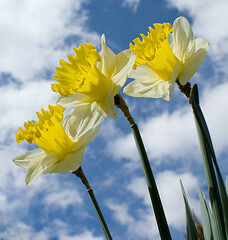 More information on these events can be found at http://www.chincoteaguechamber.com/ We invite you to come and enjoy a visit at the Island Manor House; our courtyard is popping with daffodils, tulips and crocus. We are located just a few minutes away from Assateague Island with its abundance of flora and fauna. Why not treat yourself to a Spring get-away?